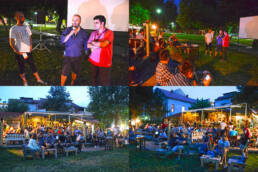 MOnuMENTImotion was in the Program of the 4th Festival of Contemporary Art “arTz” in Tuzla, Bosnia and Herzegovina. It was aired on Friday, 30 June at 9 p.m. Now let’s make it a little bit personal. Michele Parente (forumZFD BiH Project manager) and I left Sarajevo for Tuzla on Friday, missing Pannonica ArTz Open Air (electronic music party) that happened the night before. We arrived in Tuzla around 3 p.m. which has left me with enough time to go to Pannonian Lake, a complex of swimming pools/artificial lakes known for their salty water. I had my swimming pants ready. After that we went downtown for dinner where we had trout. The screening was happening at Urban Beatz Café, meaning, you are moving within 500m radius. An easy-going festival. I also found out that my good friend Boris Stapić, an illustrator and comic author from Sarajevo, is attending too. When we finally set at Urban Beatz we were joined by another friend of mine, Muris Halilović, a visual artist from Tuzla. The Festival was going smoothly and it is always refreshing to see how cultural scene of Tuzla is independent of influences from Sarajevo. It is a city with strong and recognizable scene like Banja Luka or Bihać. Because the screening was happening in cafe´s garden facing City Park it was postponed from 8 p.m. to 9 p.m. By that time the Cafe was full. Before MOnuMENTImotion several short videos done by the students of Academies of Performing Arts in the region were screened. Before screening we were introduced by Rusmir Krdžalić, the Festival director. I told a few words about making of and story behind MOnuMENTImotion while Michele introduced it as a part of MemorInmotion – Pedagogical tool on Culture of Remembrance. After the screening I could sense that animation itself was well received and I got a few congratulations for a good job. Also, some people from the audience really grasped the story. This really gave us opportunity to mingle with other participants and audience. Sometime later on we moved to the Studio Ismet Mujezinović (Atelier) where small BBQ/farewell party was happening for the participants. My friend Alija Kamber, a visual artist, a musician and a vagabond, was jamming there with his friends. So what can I say, except that I had mighty fine day in Tuzla, hanging out with my friends while attending this small and easy going festival. I hope next time I will be there for the full program.